Mr. Attah Alhassan, the Executive Director of the Timber Industry Division of Ghana's Forestry Commission, was elected Chairman of the International Tropical Timber Council (ITTC) at its thirty-seventh session held from 13-18 December 2004, in Yokohama, Japan. ·	encourage the development of national policies for the sustainable utilization and conservation of tropical forests and their genetic resources and for maintaining the ecological balance in the regions concerned. The governing body of the ITTO is the International Tropical Timber Council (ITTC), which includes all members. The Council is supported by four committees, which are open to all members and provide advice and assistance to the Council on issues for consideration and decision: Economic Information and Market Intelligence; Reforestation and Forest Management; Forest Industry; and Finance and Administration. The ITTO, the ITTA's Secretariat, is headquartered in Yokohama, Japan. The Organisation provides a framework for tropical timber producer and consumer countries to discuss, exchange information about and develop policies on issues relating to international trade in, and utilization of, tropical timber and sustainable management of its resource base. The ITTO also administers assistance for related projects. The ITTO has 59 members divided into two caucuses: producer countries (33 members) and consumer countries (26 members). The ITTO's membership represents 90 percent of world trade in tropical timber and 80 percent of the world's tropical forests. 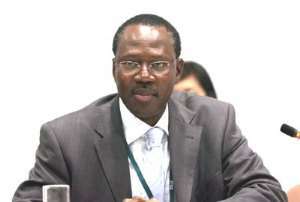 In accepting the Chairmanship of the world's pre-eminent organisation on tropical timber forests and international trade, Mr. Attah Alhassan observed that historically, the private sector has been a major engine for growth in the national development endeavours of countries, and committed to working for stronger co operation and collaboration between civil society, trade groups and government agencies in support of the ITTO's objectives. Mr Alhassan identified sharing of information, ideas and learning from member countries' experiences as being fundamental to value and wealth creation in the global tropical forest and wood products industry, and invited the ITTC members to work with him to look for opportunities through the Organisation's project work to achieve the ITTO's objective. Another priority identified by Mr Alhassan was the sustainability of the Organisation's funding. He requested member countries to work together to identify mechanisms for sourcing additional funds to ensure the long term financial security of the ITTO without unduly burdening its members. Speaking on behalf of the Government of Ghana, Mr S K Boachie-Dapaah, the Chief Executive Officer of the Ghana Forestry Commission, expressed sincere gratitude to the Tropical Timber Council for the honour it had bestowed on, and the confidence reposed in, Ghana by electing one of its citizens, as the Chairperson of the organisation. He described the ITTO as “unique and important” in serving the developmental needs of tropical timber producers which are mostly developing countries from Africa, South East Asia and South America. Mr Boachie-Dapaah acknowledged the challenges ahead of the ITTO, particularly in relation to re-negotiating a successor Agreement to ITTA, which required taking into account the current global issues of environment, poverty and sustainable development as well as the achievement of the Millennium Development Goals (MDGs). He informed the Council of the commitment of the Government of Ghana to the objectives of the ITTO, and indicated that the Government of Ghana was prepared to support Mr Alhassan to ensure the success of his tenure.